I’ll be doing a house (backyard) concert with the amazing David Grier at Steve Palazzo’s house in Santa Cruz, CA, on Sunday July 13. We’ll each do a short solo set and then a set together. Email spalazzo@cruzio.com for reservations. As some of you know, I’m in the process of launching a new roots-music instruction, news, and gear site for players of guitar, mandolin, banjo, dobro, fiddle, bass, and ukulele. It’s called Peghead Nation and it will launch in May 2014. 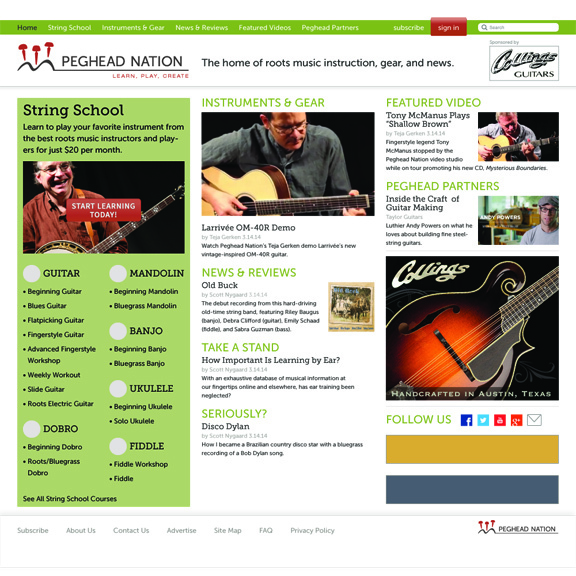 Peghead Nation is the brainchild of three former Acoustic Guitar magazine editors: myself, Teja Gerken, Dan Gabel. With Peghead Nation’s subscription-based e-learning courses, musicians will learn to play their favorite instruments with some of the best teachers in the roots music community. They will also stay up-to-date with the latest happenings and news from the roots music world with our video demonstrations of new instruments and gear, reviews of great new albums and videos, backstage conversations with touring musicians, thought-provoking and humorous columnists, and much more. The acoustic power trio of mandolinist John Reischman, guitarist Scott Nygaard, and bassist/mandolinist Sharon Gilchrist blends traditional bluegrass and folk styles with their own personalized visions of contemporary acoustic music, reshaping old melodies and composing new music based on traditional forms with an improvisatory flair and melodic richness. Reischman and Nygaard, both Grammy winners revered in the acoustic world for their melodic virtuosity and impeccable tone, have been performing together off and on since the early ‘90s, when they played on each others’ solo recording debuts for Rounder Records. They are joined by Gilchrist, whose mandolin and bass playing have been in high demand for years, gracing the bands of acoustic and bluegrass icons Darol Anger, Peter Rowan, Tony Rice, Laurie Lewis, and others. 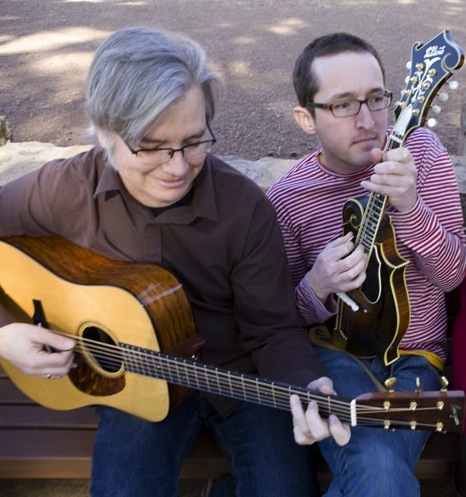 Reischman’s most recent album, Walk Along John, was described by Bluegrass Today as combining “blazing bluegrass, stately old time melodies, and even reckless, seat-of-the-pants improvgrass,” a fitting description of what you can expect to hear from these three empathetic musicians. I’ll be doing a concert with mandolin whiz (and Crow Molly cohort) Joe Walsh on Feb. 21 at Eric Schoenberg’s guitar shop in Tiburon CA. Then we head down to Palo Alto on the 22nd for workshops at Gryphon Stringed Instruments. 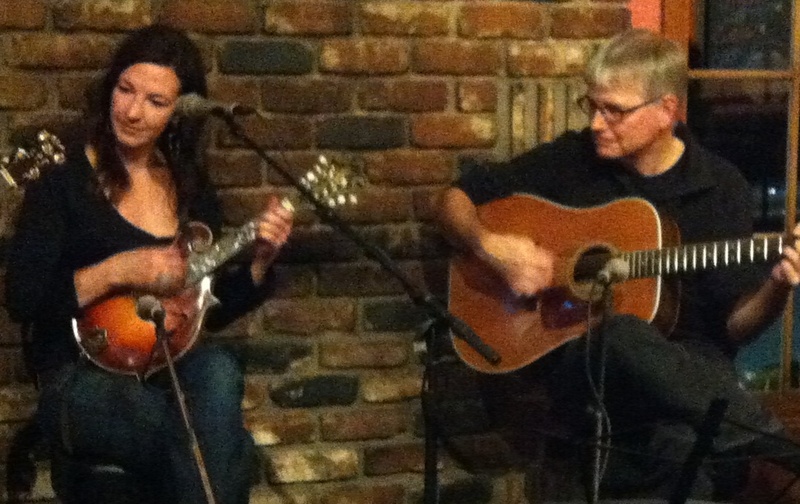 Joe will do a mandolin workshop and we’ll both host a workshop on playing mandolin and guitar duets. Well, not exactly solo — I’ll be sharing the stage with fellow guitarists Teja Gerken and Doug Adamz, but we’ll mostly be doing the round-robin solo guitarist thing. Wed. Oct. 9, 8 pm. Sleeping Lady, Fairfax, CA. Sharon and I will be playing as a duo at Stevie Coyle’s mighty fine Mighty Fine Guitars, Sat. Sept. 7, in Lafayette, CA. It’s a nice intimate setting with lots of beautiful guitars on the walls. Come on down. Ashokan Guitar Camp, July 28 – Aug. 1, Ashokan Camp, Olivebridge, NY.